I finally did it. 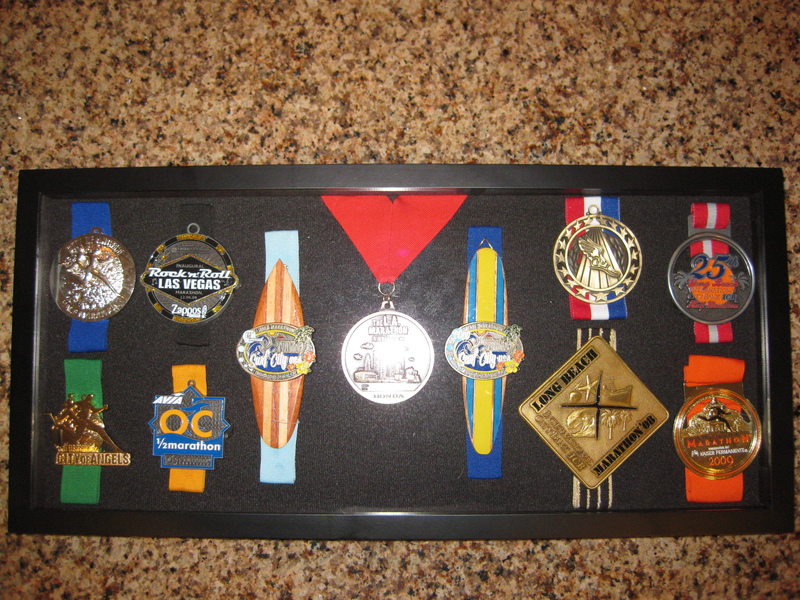 I finally put all of my race medals in a nice display box. Back in May (https://christinaruns.wordpress.com/2010/05/29/what-to-do-with-all-of-those-race-medals/), I decided that I wanted to create a display for my race medals. I searched around until I figured out how I wanted to store my medals. For the longest time, they were just in a plastic shoe box tucked away in my closet. This DIY marathon medial display case project was actually quite simple. The most difficult task during this venture was actually deciding which shadow box to purchase and how to arrange my medals, mostly due to my indecisiveness. 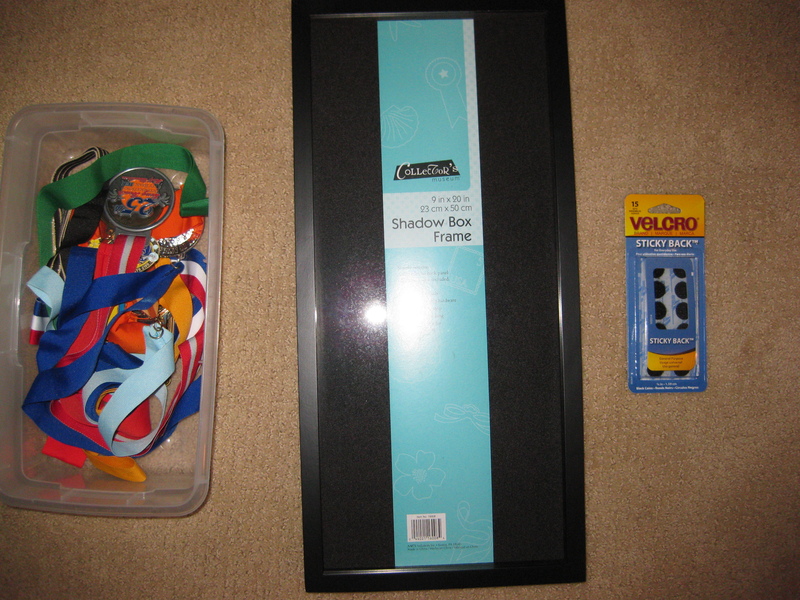 I started this project with the following items: my plastic shoe box filled with race medals, a shadow box purchased from JoAnne’s, some extra Velcro, scissors, and some tacky glue. The first thing I did was arrange the medals on the black backing of the shadow box. I already knew that I wanted the ribbons from each medal folded neatly behind its corresponding medal. 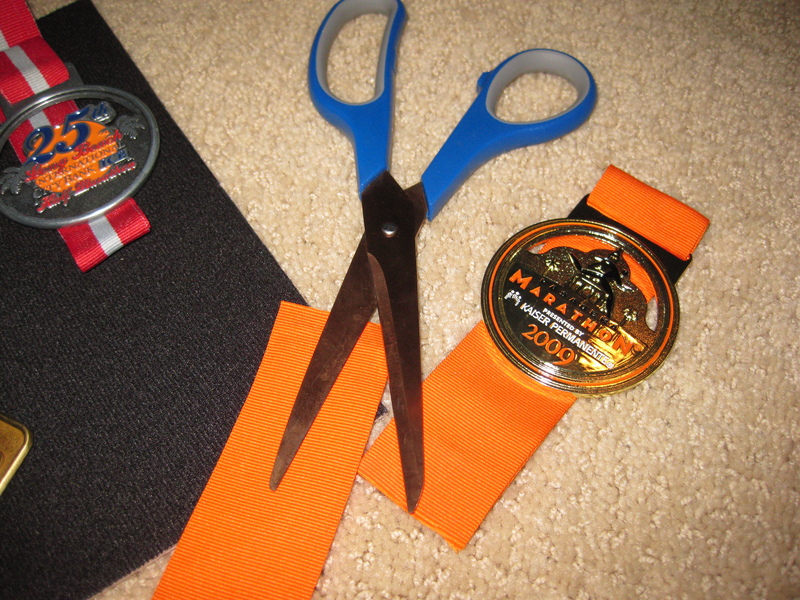 Then, once I knew how I wanted the medals organized, I took my scissors and made the first cut. At first I hesitated to cut the ribbon off of the medal, but I knew that I needed to cut the ribbons so that there wasn’t extra bulk behind the medal weighing it down. I then folded the ribbons into neat sections and glued the ribbon in place to make sure that all layers of ribbon were neatly aligned. 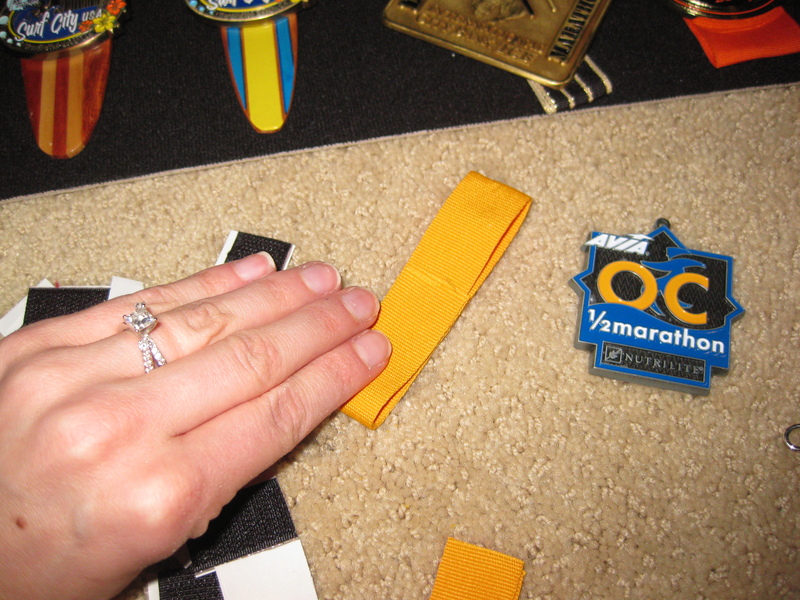 I also glued the actual medal to the ribbon to make sure that it was securely fastened. Some of the medals are quite heavy, and I wanted to make sure that everything in the display case was securely fastened. 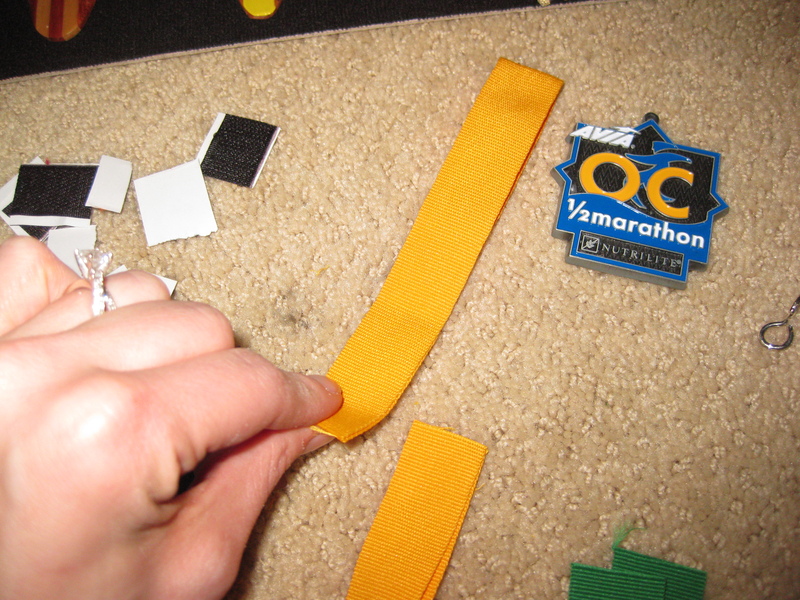 I was able to cut every marathon medal ribbon easily without hesitation except for one. For some reason, I just couldn’t bring myself to cut the ribbon off of my LA Marathon medal, which was my first marathon. I decided to place that medal right in the middle of the display board and keep the beautiful red ribbon in tact because my goal of completing that marathon is what turned me into a runner in the first place. Here is what the completed project looks like. I am quite pleased with myself and I cannot wait to hang it up. Now, I just need to remember to buy some nails the next time I am out running errands. Wow, that turned out great! I like how you arranged them and put a snippet of the ribbon behind each one. I’d be anxious about cutting off the ribbons too, and I don’t know why. Mine sit in a cardboard box in our closet. It’s not like I’m going to dig them out one day and wear ’em around. It serves them justice to see some daylight 🙂 What a great motivator to look at. Ohhh, nice idea! I don’t think I could brave cutting off the ribbons, but it turned out really great! It was difficult to cut them, but then I had to assure myself that I do not have any plans to ever wear them again. 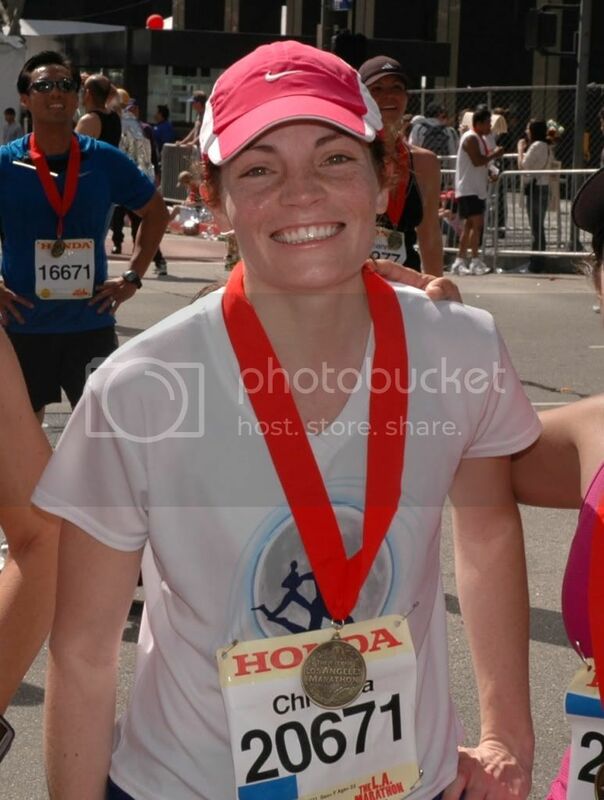 Although, I did not cut my first marathon medal. I still can’t bring myself to throw away the rest of the ribbons though. 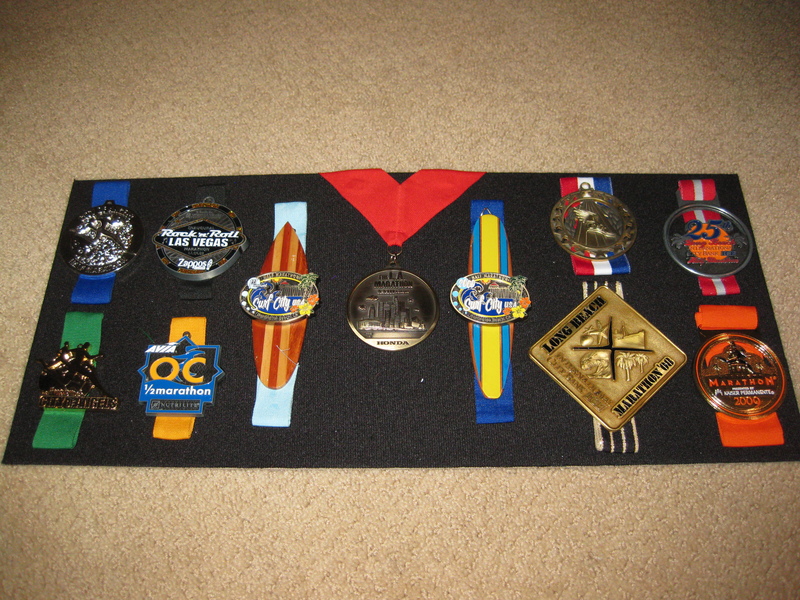 I have been looking for a way to display my husband’s bibs and/or medals from the marathon, half-marathon, 10ks and 5ks that he has participated in. Do you have any suggestions or have you seen anything that displays both? We bought a huge canvas the other day to try to make something out of it. We thought about the shadow box but the bigger ones are $50-$100. Yours look great! Thanks. If you check the JoAnne’s or Michael’s ads, they usually have a coupon for one item, which would help with the larger shadow boxes. It looks awesome and now you get to see it everyday. I’m going to look into that too. Thanks for the idea. My daughter is a highland dancer and wins similar metals with ribbons but really do not want to cut the ribbons. 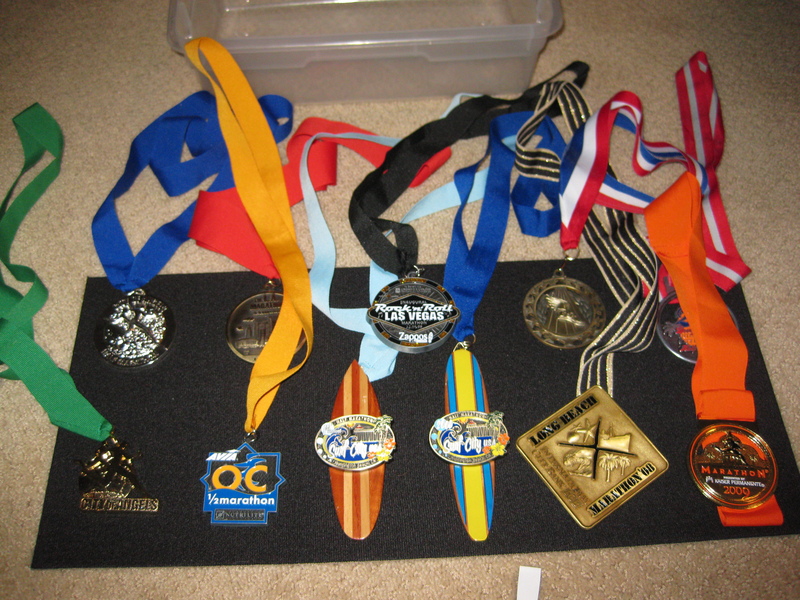 Also some of the metals to not have ribbons so the case for us would have to accomodate both. Any suggestions. You can always fold the ribbons behind the medals. This case, I believe, is 1/4 an inch in width. You could still add in medals without ribbons. If needed, they make wider shadow boxes also. Thanks for the great idea. I have all my Chicago Marathon and half-marathon medals sitting on a book case. The thought of cutting the ribbon scares me, but like you said, I will never wear them again. This sounds like a great project while in recovery mode. You are welcome. It will turn out great!